ROE NO MORE MINISTRIES | Founded and Directed by Ms. Norma McCorvey, Jane Roe of Roe v. Wade!! Welcome to ROE NO MORE Ministry. ROE NO MORE is dedicated to the Truth that even YOU can be WON BY LOVE. Ms. Norma McCorvey, the former Jane Roe of Roe v. Wade, is the founder and director of ROE NO MORE Ministry. ROE NO MORE is primarily a speakers referral ministry, but encompasses many ways in which to spread the sanctity of all life and the intrinsic right to life, especially of the unborn. Help Roe No More Ministry by making your tax deductible online donation today! Sign Roe No More's online guest book! 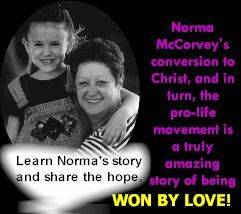 Order Norma's book, Won By Love, and the video, Reversing Roe: The Norma McCorvey Story for a special on-line price! Are you a post-abortion victim, or thinking about abortion? In Texas, please call 1-972-BABY-DUE. Roe No More Ministry appreciates the interest people may have in using any of the content found at http://www.roenomore.org/, especially students for use in projects or papers. We ask, however, that expressed permission be granted before using this copyrighted material in any nature. For permission, please call 214-343-1069, send a letter by fax to 214-343-8006 or send an e-mail to copyright@roenomore.org. In addition, any written works submitted to Roe No More Ministry, Inc. by electr! onic mail, fax, e-mail, or those words posted on this website’s guest book become the property of Roe No More Ministry and thus may be reproduced without the author’s permission. Thank you for your understanding and compliance. Roe No More Ministry is a not-for-profit organization, and is recognized as a 501(c)3 organization by the US Internal Revenue Service.